I finally create something scary again..
About a couple weeks ago my friend, Ron, told me that there was a photo contest. Not just an ordinary photo contest, it was #AsianFearFest photo contest. 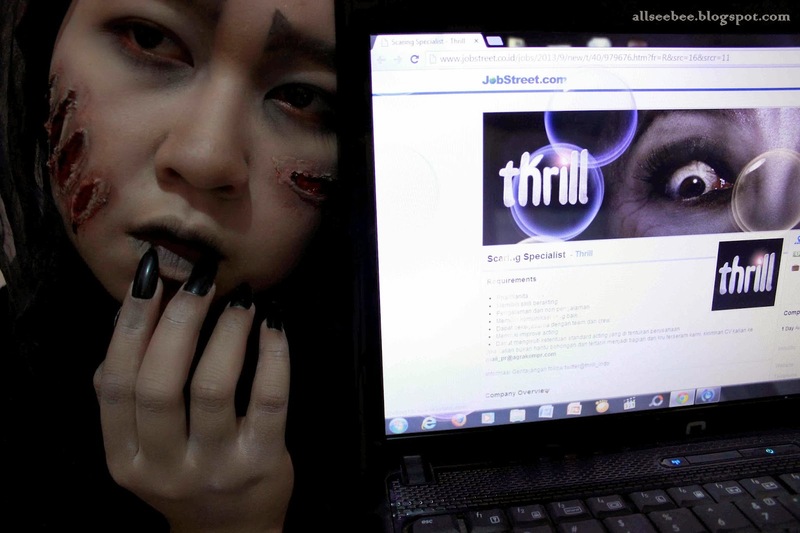 So, we have to dress up as a ghost and take a photo with Thrill advertisement. Let me explain something here.. The competition is about asian ghost, especially Indonesian ghost. Well, since I'm wearing hijab, I can't do any female ghost that Indonesia have.. I don't need to name those ghost, you can name them your self..
Actually the concept of my photo is 'None Jakarta'. I thought that I could combine the 'None Jakarta' look and creepy kind of look together. So I can pull off Indonesia theme and the ghost theme together and still covered in my photo. For the blood, I just used soy sauce with a little bit of red chili food grade color. I hope my photos didn't really scare you..